System Shock’s remaster already looked stunning more than a year ago. Citadel Station, thought rendered obsolete by two decades of first-person genre development, was resplendent in that first trailer – a blue-green cathedral of coloured lights and jittery post-humans. It was as if developers Nightdive had casually dropped the word ‘cyberspace’ into conversation and not only got away with it, but somehow made it sound right again – even relevant. Related: the best first-person shooters on PC. “All game content in this video is subject to change,” read the disclaimer. It was tough to imagine why anyone would change anything about this densely stylised sister to the Bioshock series. Yet change it did. 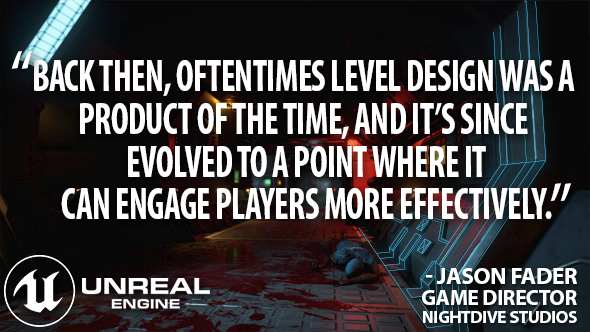 Why did Nightdive shift the new System Shock from Unity to Unreal Engine 4? And what’s new now that they’ve made the switch? There were two important considerations behind the engine swap. First, after conversations with both Epic and Unity, Nightdive decided Unreal Engine 4 would be the better choice for hitting their performance targets on consoles. And second, more pertinent for our purposes, was the team. Nightdive have hired a bunch of “very senior” developers, a number of whom worked alongside game director Jason Fader at Obsidian on Fallout: New Vegas. Thankfully, Nightdive were able to pull over a “good chunk” of the work they’d already done in pre-alpha. “The code doesn’t really translate, but the core fundamentals of the system we were working on definitely do map over,” says Fader. Creature design, items, weapons, and to a certain degree environmental layouts – all were translated from the Unity demo with a minimum of time lost. In March, less than a year after the initial reveal, Nightdive put out another trailer in Unreal. Ask Ken Levine about working in Thief’s Dark Engine for System Shock 2 and he’ll tell you about carving passageways into the editor, as if space itself was made from dense rock. Rebuilding Citadel for the new System Shock couldn’t be more different – the team used a tile-based construction system reminiscent of the one Fader and much of his team worked with on Fallout: New Vegas. An issue that Bethesda have run into in the past is ‘asset fatigue’. It’s that uncanny sense, on the 20th Ayleid dungeon, that you’ve seen that same set of sarcophagi before. Once you’ve noticed, it’s hard to shake – and it’s something Nightdive are working to avoid. A corridor in a space station might not in itself set the industry alight with its visual inventiveness. But the way it’s dressed, with cybernetic doohickies, body parts, and dramatic lighting, can play on our fears and make it distinctive. Of course, Nightdive are somewhat wedded to maps drawn up by Looking Glass in 1994. That’s no bad thing – there were few, if any studios in the ‘90s, with greater pedigree in that area – but the team aren’t letting the limitations of two-decades-old level editing hold them back. 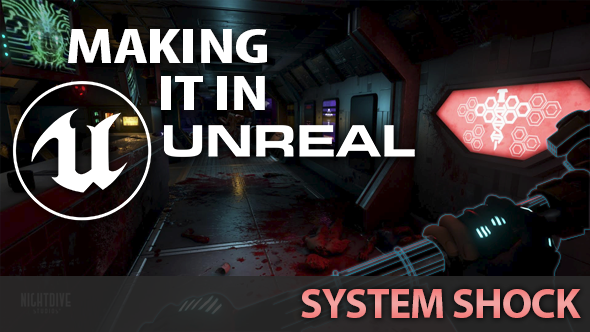 The most striking part of System Shock’s Unreal Engine 4 trailer – more tech demo than representative slice of the game – was the moment a couple of mutants were frozen solid by a nearby fuel canister. Using a wrench, the player was able to knock heads and limbs off the station’s new statues, which keeled over and shattered on the hard metal floor. The team looked at the way freezing was handled in Bioshock and Mass Effect, but found their solutions lacking. For System Shock, Nightdive have been working with an Nvidia package that can turn a non-static mesh – i.e. a living, lurching mutant – and turn it into a static mesh, so that it essentially becomes an object in the world. That object is then subject to locational destruction in a way it wasn’t just moments before. 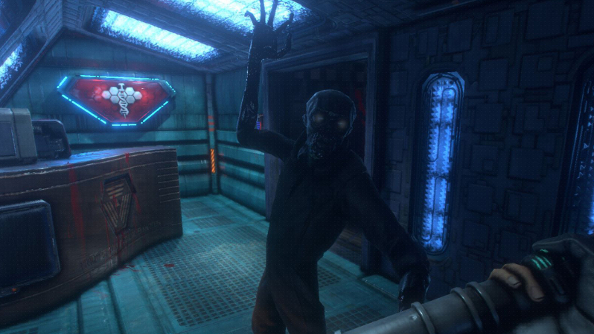 System Shock is coming to PC. Unreal Engine 4 is now free. In this sponsored series, we’re looking at how game developers are taking advantage of Unreal Engine 4 to create a new generation of PC games. With thanks to Epic Games and Nightdive Studios.